COMIC OF THE MONTH: SHADOWMAN: END TIMES #1 Not only is it cool that when Valiant do a mini-series, they pause the main series of the character so fans can afford it, Peter Milligan's work on this title has given it that awesome classic Vertigo vibe, without the pesky 'Mature Readers Only' tag. The research he has poured into Shadowman's voodoo world and fragile psyche make this book killer. With Jack literally on the edge of sanity as he wrestles with his possessive Loa, you don't know who the hero of the book is and nor do you care. None of the characters are golden, but all shine, and while this new reader friendly mini lacks the darkened art of De La Torre for atmosphere, if you like horror, here is where you should sink your pay. 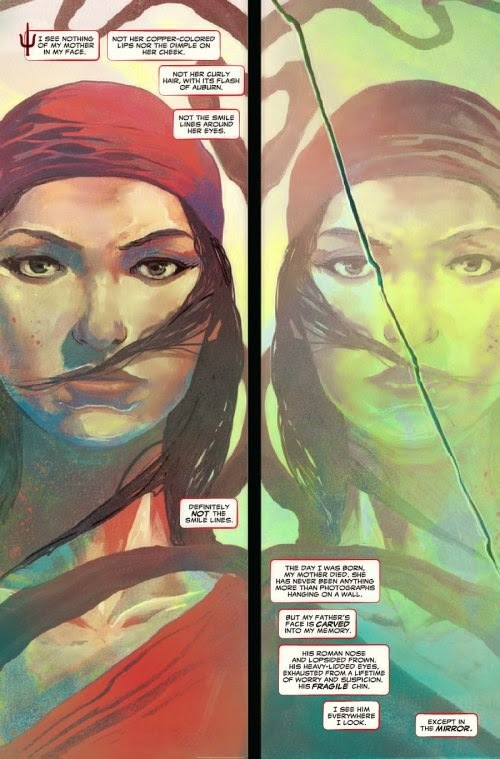 ELEKTRA #1: This issue is stunning. Of all the Marvel Now #1's I've brought, Elektra beats all, save Robinson's Fantastic Four. Sent on an assignment by the stylishly blunt Matchmaker, Elektra hunts a man who has bested Sabretooth and Taskmaster at the same time. As she heads to Monster Island, Bloody Lips rises in Australia to digest information on where Fury has hidden Bullseye. Add to that Matchmaker previously saying a satellite sweep of New Zealand produced a hit, and Lips actually sounding like an Ozzie, and finally we southern hemisphere fans have a writer who not only likes us, but doesn't get their dialogue from Crocodile Hunter reruns. 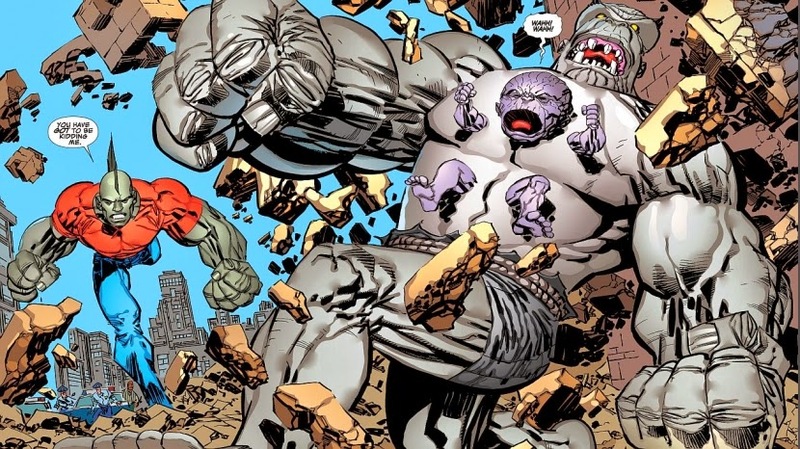 ERIK LARSEN: I wanted to catch-up with Savage Dragon and with #193 the first in a new direction where Malcolm takes over from his Dad, that issue was quickly plucked. Sadly the issue closes with Erik announcing the passing of his father in the letters column, a touching reminder of why Image Comics work so well; they allow you to share life with your favourite creators, and Larsen's life will always be tied to the infamous green mohawks of this title. Aside from that, Dragon is still a book that puts a smile on my face. From the villain Tantrum (below) to Larsen's trademark art style and language, in this "bold new direction" (unlike so many of late), the baby hasn't been thrown out with the bathwater, and we should all be thankful for that. 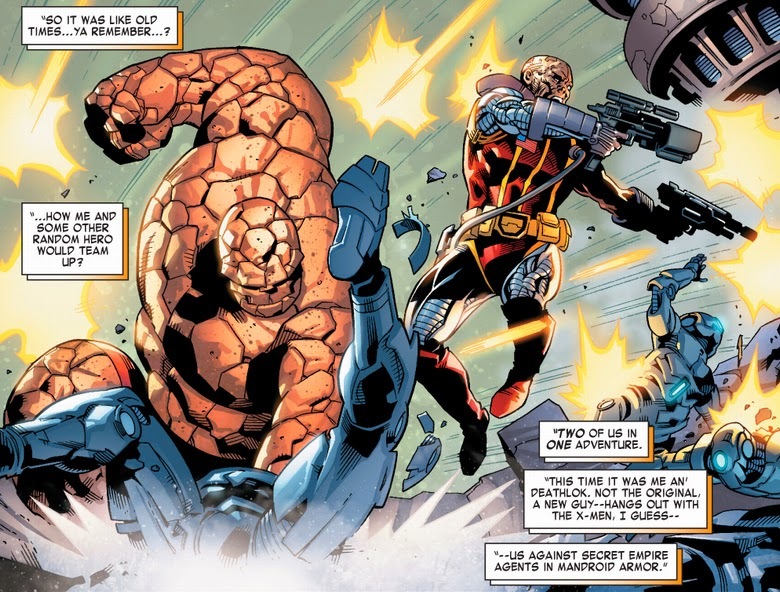 MOMENT OF THE MONTH: MARVEL TWO IN ONE James Robinson not only gets an award for reminding people of Namor's giant walking whale army in both Fantastic Four #3 and All-New Invaders #4 within a few weeks of each other, the retro-man also managed to work into the FF, Ben Grimm reminiscing on his days as the star of Marvel team-up title, Marvel Two-In-One. I've said it a bazillion times, without Brave and The Bold, DC Comics Presents, Marvel Two-In-One, Marvel Team-Up, and their kind, there would be no IADW. I feel 'done in one' stories are key to attracting new readers, and these titles offered a tour of their respective universes anchored by their biggest stars. In short, they are sorely missed, and it's nice work having Thing miss them too. Good haul Dan. I miss those old Marvel-Two-In-One/Marvel Team-Up adventures too. Unfortunately they don't sell as well as they should anymore. I think a lot of that is due to poor matches for creative teams, as well as a good cast for an arc or two. That Shadowman mini looks good, as does Elektra, Sorry to hear about Larsen's dad passing away. Perhaps this was a good time as any to officially have Malcom replace his father then. Yeah it was a sad note to read Dale, especially giving what an influence he was, as all good parents are. I'd like to see a writer like Joe Casey take a team-up book, I know he's happy in creator-owned land at the moment, but his ability to mix classic and modern would go great with a Spider-Man team-up title. I would say Kurt Busiek, but he's already proved he can on that very book.